Yesterday, I had posted about a wonderful samosa recipe I had come across at U.S. Masala. This amazing blog has a bunch of wonderful recipes that I so want to try. Why perusing this space, I found a recipe for a Green Chutney as well as a Tamarind and Date Chutney, both of which can be used as accompaniments for a large variety of chaat and Indian snacks. I was very pleased with how both of these turned out, just the way I like it. These are going to be my "Go To" recipes for now. And it'll not be easy to knock these off their spot. Blend all the ingredients till you get a smooth paste. Adjust salt and lemon to taste. You can decant it in a clean glass bottle and refrigerate if you aren't using it immediately. In a heavy bottomed pan on medium heat, place the tamarind pulp and water and mix well. Add the dates and let it come to a boil. Lower the heat to medium low and add the jaggery and mix. Let it cook on medium to medium low till the jaggery melts and the sauce reduces to half, stirring regularly. Add the salt and all the spice powders and mix well. Cook for about 2-3 minutes and turn the heat off when it gets to a ketchup like consistency. Keep in mind that this sauce will thicken as it cools. Delicious and tangy looking chutney. 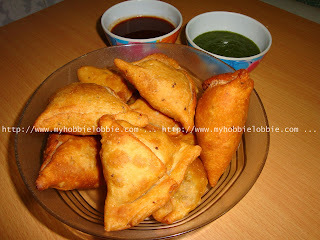 Just multiplies the taste of the samosa.